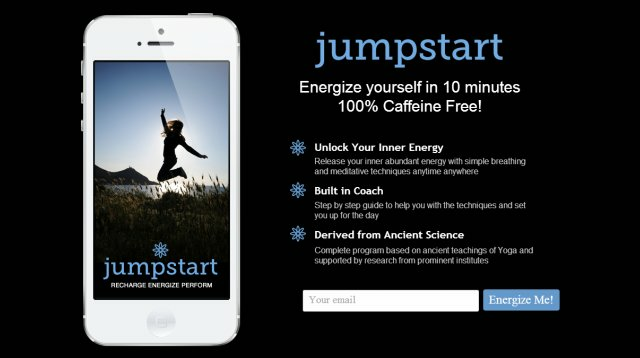 Jumpstart coaches you with simple breathing and meditative techniques to recharge and energize yourself in under ten minutes, so that you can perform your best through the day. Most of us have stressful lives and we rely on things like coffee and energy drinks to get us through the day. It helps you skip the caffeine and unlock your inner energy. So, before you reach for that cup of coffee, try jumpstart! Launching in June 2013 - Follow them on Twitter for updates.